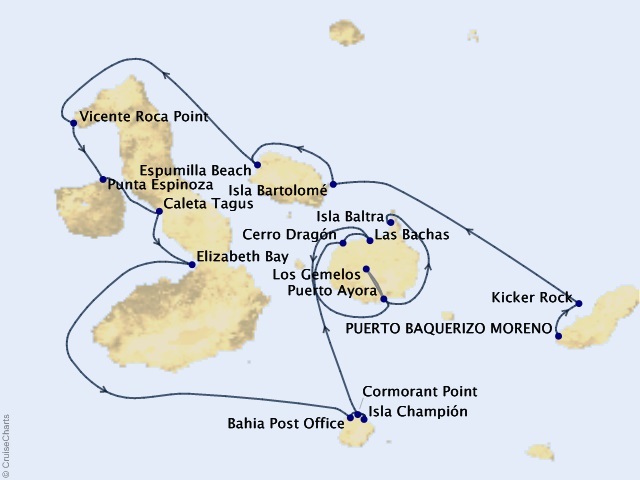 Departing from Isla San Cristobal (Puerto Baquerizo Moreno) on April 25, 2020, prices starting at $8,460. Silversea's smallest ship at just 100 guests, Silver Galapagos fuses seamless shore excursions, quality lectures and multiple Zodiac landings with excellent dining and plush all-suite accommodation. An expedition aboard Silver Galapagos brings you to one of the most isolated places in the world to encounter an abundant variety of wildlife species that is incredibly unique and found nowhere else on earth, all in incomparable style and safety. Lying just off the western coast of South America, the Galápagos archipelago is inaccessible to most, yet this isolation has allowed nature to develop in ways exclusive to the islands. Experience it all on the Silver Galapagos with complimentary exploration activities including Zodiac tours, snorkeling, kayaking and nature hikes led by our highly experienced guides certified by the National Park of the Galápagos. A quiet sanctuary where large picture windows provide panoramic ocean views. Terrace Suites provide splendid repose for three guests, along with easy access to public observation area with patio furniture. The spacious Veranda Suite's plush comfort with more space to relax. The private balcony with patio furniture vaunts panoramic views throughout thecruise. Three guests can rest comfortably in deluxe elegance. Spacious, with a welcoming sitting area, a marbled bathroom and your own private balcony with patio furniture. Silver Suites can accommodate three guests in luxury.